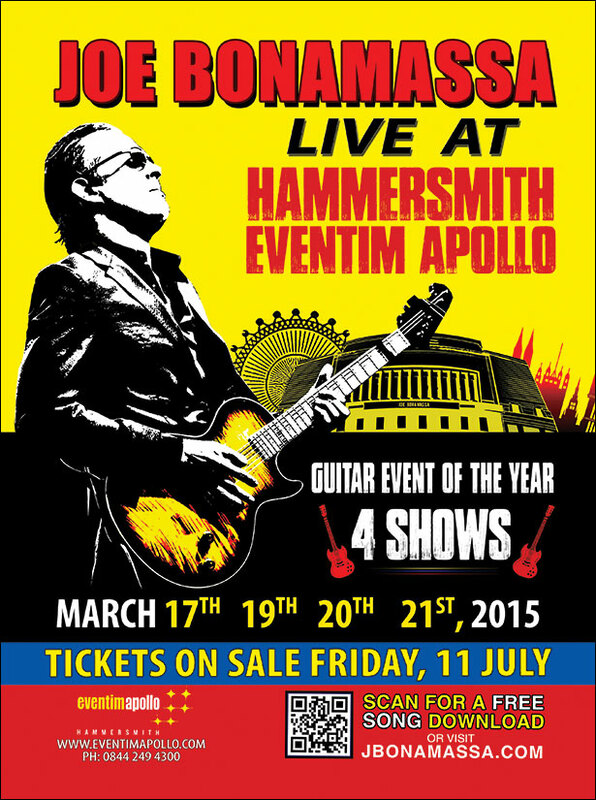 Following the recent announcement of Joe Bonamassa’s forthcoming studio album “Different Shades of Blue”, released 22nd September, the internationally renowned guitarist is proud to announce four exclusive concerts in March 2015 at the prestigious Hammersmith Eventim Apollo London (formerly the London Hammersmith Apollo). Planet Rock will run an exclusive 48-hour ticket pre-sale on Wednesday 9th July via www.planetrock.com. Tickets will then go on sale to the general public at 9am on Friday 11th July from the 24 hour box office: 0844 249 4300 and www.eventimapollo.com. For the first time, fans will have the option to pre-order the new studio album with their concert tickets in a special bundle. This will be available both during the 48-hour Planet Rock pre-sale, and when tickets go on sale to the general public on Friday 11th July. The 2015 Hammersmith concerts begin a new chapter in the book of Joe, and follow his critically acclaimed “London 2013” tour, which saw Bonamassa pay homage to his UK fans and unique relationship with England’s capital city. Currently his only confirmed UK concerts, the 2015 Eventim Apollo dates will see Joe perform an entirely new show. Featuring songs from his new album “Different Shades of Blue” played live for the very first time in the UK, including a sensational horn section, these shows are a guaranteed must-see for “Bona-holic” both new and old, and guitar aficionados everywhere. Joe and his band will also perform classics from his extensive back catalog, including “Sloe Gin”, “Dust Bowl”, “The Ballad of John Henry”, and 2012’s critically acclaimed “Driving Towards The Daylight” (which reached #2 in the UK’s Official Album Chart).